In this Ethereum trading review, we prepared for your detailed analysis of all trading aspects regarding the cryptocurrency. We review available platforms where you can trade Ethereum, as well as Ethereum news and tools such as API, charts, and other softwares. The article concludes with trading regions and a guide on how to short your ETH. Also, read our articles about Ripple trading and Bitcoin trading. In this section, we go over available tools of your Ethereum trading. When it comes to APIs, bots, charts and other tools, Ethereum comes at a close second place to bitcoin. In most cases, platforms support both (and all other coins as well). What makes Ethereum different form bitcoin is that it has its own builder’s platform, Ethereum.com. As seen below, using open-source coding, you can create your own API and trading bots, implementable in many platforms. Haasbot once does support day trading Ethereum activities through its API and bots. You only need to choose the coin and then implement the tool in a vast number of platforms. Available APIs for you are StochRSI, MACD-Histogram, PPO, and Ultimate Oscillator. CoinMarketCap, Blockfolio, Trading View and several others are all available for you to use. You can download the mobile app (Blockfolio) or even create your own trading Ethereum chart (Trading View). Essentially, most of the tools available for bitcoin are available for Ethereum well. You can analyze Ethereum price and volume through indicators gathered by Cryptotrader. Then, you can combine it with Haasbot to automatize your trading strategy. 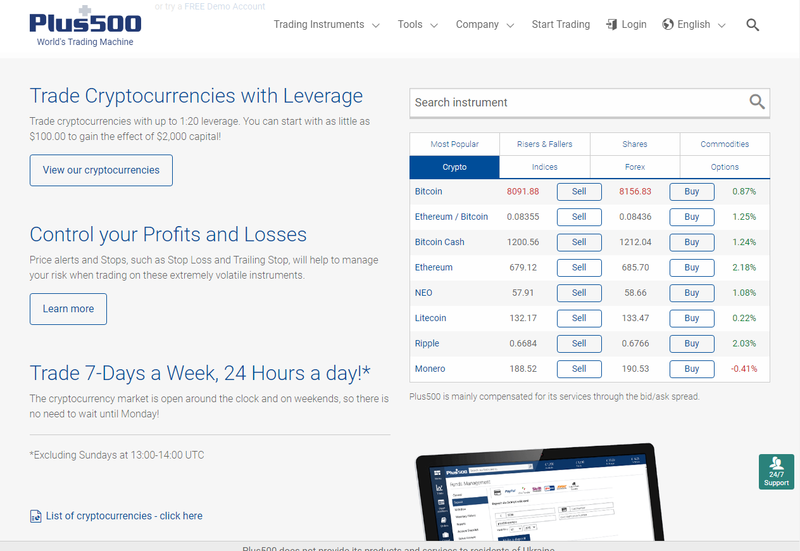 This part is focues on software available for Ethereum trading. We also have specialized articles on similar topics like crypto trading bots and crypto trading apps. When it comes to softwares, APIs and bots do come from somewhere. There are numerous platforms out there that either allows you to download their softwares for free or paid. Haasonline is one of them, offering a wide range of services depending on your needs. You get to choose between three plans, them being Simple, Beginner and Advanced. Haasbot is but a part of the platform, meaning that other products are available. Development is also active and you can learn all about it at our review of the Haasonline through this [link]. Plus500 is probably the most famous example of trading software. It supports several cryptos, Ethereum included. You can download the program for free and use it to trade ETH. The platform’s issue is that some regions might not be supported, while the USA, European and some Asian regions are available. You can check out the interface in the picture below. As seen above, most softwares work for Ethereum and other popular cryptocurrencies, such as bitcoin, Litecoin, and Ripple. We can say that Ethereum does not enjoy bitcoin’s support but it is close in terms of available trading tools. Read more about the platform in our Plus500 review. This is where Ethereum starts to look over all other coins, with an exception of bitcoin. It is present in almost all platforms but its volume traded is inferior compared to bitcoin’s. Binance is a crypto-to-crypto only platform, where simple trading tools are available. It offers a large range of crypto coins, Ethereum included. You get to choose between Basic and Advanced interface though functions remain unchanged. Available tools are Market, Limit, and Stop-Limit functions, while Ethereum trading volume on daily basis stands at 6.000 coins. To learn more about the platform, go to Binance review. GDAX (Global Digital Asset Exchange) is an extension of Coinbase with an aim to provide more complex trading tools. The available deposit method is bank transfer, with only 32 countries currently supported. Ethereum is one of the main currencies, with daily trade surpassing 120.000 ETH in volume. Trading functions are practically the same as with Binance, as you have Market, Limit and Stop markets available. Poloniex is similar to Binance as you can trade with ETH by pairing up only other altcoins. The platform offers the very simple trading marketplace, where around 1.000 ETH are traded on daily basis. Available functions regard Market and Stop-Limit, as well as the Lending marketplace. Should you wish to know about the verification demands, trading and fees, visit our guide on to Poloniex review. As with bitcoin, you can use a variety of instruments available to you. BitMEX offers futures and swap contracts. Futures allow you to purchase Ethereum at a specified price at the predetermined time in the future. The instrument can be exercised in platforms with more complex functions available, like Crypto Facilities and BitMEX. Swaps, on the other hand, are available in most trading platforms, Binance and Poloniex included. You simply exchange the ETH coin with other altcoins or assets/commodities. Overall, the availability is similar to bitcoin Litecoin, though volumes are considerably lower than those of the leader, BTC. For more information regarding crypto trading instruments go on to our more focused article called Crypto Trading Instruments. When it comes to supported regions and regulations, much the same rules apply for Ethereum that bitcoin has. Governments look at the cryptocurrency market as a whole and dos not distinguish separate coins from each other (yet). USA and Canada, for example, view all cryptos as online commodities and not as a legal tender. As soon as you use Ethereum in pair with fiat money you have deposited, you are subjected to tax. Ethereum trading India, on the other hand, is difficult if you are to use INR or USD. Central Bank forbade its banks to work with cryptocurrencies, Ethereum included. This means that for crypto-to—crypto you do not need to fill out tax report but you will have very hard time to find a platform where fiats are involved. Using Ethereum trading view, many platforms offer you an opportunity to short Ethereum. The four main trading strategies for ETH trading being margin trading, futures/swaps contracts, binary options, and prediction markets. Read more about these in crypto trading instruments. BitMEX and Crypto Facilities offer futures and swap contracting though only through crypto-to-crypto trade. Bitfinex, eToro, and GDAX offer binary options, and prediction markets though Binance and Poloniex can be used as well. The last two strategies are more visible than futures and swaps. Shorting a cryptocurrency is only for more experienced traders. Make sure to read advanced crypto trading and how to start cryptocurrency trading. In this Ethereum trading review, we went over the trading capabilities of the digital coin. When considering Ethereum trading vs Bitcoin trading, bitcoin still definitely holds the upper hand in terms of volumes traded. Trading itself, however, shows very little difference between two cryptos. Ethereum seems to have similar support as bitcoin and higher than other cryptocurrencies, such as Litecoin, and Ripple for example. Read about Litecoin trading and Ripple trading.